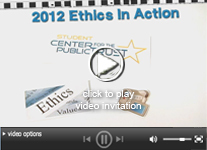 NASHVILLE, Tenn., (January 18, 2012) – The NASBA Student Center for the Public Trust (SCPT) today announced the launch of the National Ethics In Action Student Video Competition. In its third year, this exciting competition encourages college students to unleash their creativity while focusing on the theme of portraying ethics and accountability in the business world through video – Changing the World One Frame at a Time. With the prevalence of ethical dilemmas of recent years – the Madoff scandal and Wall Street’s impact on the economic crisis – parent organization, the NASBA Center for the Public Trust (CPT), realized there is an opportunity to influence future business leaders by educating today’s students on ethics, accountability and integrity. The competition is open to all U.S. college students, and seeks entries from students across all majors. Categories include 3-5 minute short film and 30-second Public Service Announcement (PSA). Cash prizes range from $250 to $1,000. Interested students are encouraged to visit: www.studentcpt.org/videocompetition to register their team and learn more about the competition. Team registration deadline is March 1, 2012. Video submission deadline is March 30, 2012. Winners will be announced April 10, 2012. Interested parties are also invited to view a brief YouTube video announcing the competition. The competition this year is sponsored by the Lipscomb University Dean Institute for Corporate Governance and Integrity. Established in 2009, the NASBA Student Center for the Public Trust (SCPT) was created to educate and engage future business leaders on topics related to ethics, accountability and integrity. Based on college campuses across the U.S., the SCPT provides an interactive environment where ethical behaviors and ideas can flourish, while creating opportunities for students to network with the business community and develop professional leadership skills. http://www.studentcpt.org.